This contact clear Choice 32 oz. deli container and lid combination is perfect for soups, stews, sauces and deli products. The matching lid is convenient for loose fruits and vegetables. Not compatible with Newspring DELItainer products. We use these to make cotton candy in tubs. I like the fact that these are super clear and durable. I will be buying more. These containers are the best for our all-natural cotton candy. We can make the cotton candy ahead of time and seal it in the containers to keep for days. Thank you for the review, Carolina! We're sorry these did not suit your uses. Try these 32 oz. 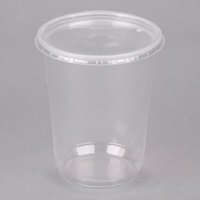 Microwavable Translucent Plastic Deli Containers with Lids instead for a more durable option! Started using choice brand products recently instead of ordering through the big food supply companies and they are just as good as some of the more expensive competitors. They hold food well, just be careful with very hot liquids. Choice 32 oz microwavable clear containers are the perfect round containers to pack your soups with. They can withstand the heat and do well in the microwave. we use these for all our food prep and storage. despite their heavy use, they can be used over and over again. highly recommend these containers! These deli containers are great for sending items to-go. They are also microwavable which is what I was looking for. I will buy again soon. Perfect for measuring out ingredients when doing large batch bakes, they also handle the heat of the microwave very well and are sturdy when you have to stack them on top of each other. I use the Choice deli containers for all sorts of things in and around the kitchen. These are a great product and the price is right. Plus they come in a variety of sizes and the lids hold tight. Will be getting these again for sure! We package and send food home with our customers after each event, these are study and cost effective. We also ordered lids which fit very snug. Great product! Just as described. We will definitely order again. We have had issues with similar products where the lid does not properly fit the container, but this is not the case here. I bought these to use for my catering company and have been very pleased. The lid fits well and it is a good value. They are the perfect size for nacho bars, dressings, sauces, etc. These containers are meant for light duty and are best used only once. They will not hold up to freezing but are a good way too quickly heat up rice. Excellent for take out! We use these for almost everything. My Kitchen staff loves it too. We use them store all type of products. Highly suggest it. Not bad for the price. I was looking for something I can put in the dishwasher and freeze but for less than the containers I was using. These seem a little flimsier but good value for this price. We used to use foam container for our Italian ice but a customer informed me that those would break when you try to scoop it out so we switched to these. I find these have less complaints, a lower cost and people ooh and aah over the pretty colors in their quart container. Love them. Perfect for storing soup and other liquids prevents spills very well! Great price for the quality you are given too, highly recommend this product if you're considering! I primarily use these containers for leftovers and meal prep for personal use. The lids stay more secure than Tupperware and are convenient for transport. These are nice and much stronger than the clear ones. The clear ones crack a lot easier so stick with these. The lids are interchangeable. These containers are working out great for home use. They are specially great for storing left over soups and then taking it for lunch. I microwave lunch right from the containers. Similar to the 8 oz and 16 oz containers, these are a great add to any commercial kitchen for small batches of prep. They stack easily and you can see the product before you pick it up if needed. They can be labeled easily and use the same lid as the 8 and 16 oz containers. We are a bit more demanding on our deli cups then usual as we use these cups as temporary holding tanks for incoming large fish orders. This means our cups are filled with water, cleaned regularly, dropped, subjected to dish washing, and so on. These cups hold up remarkably well and don't easily scuff and scratch. We are very happy with these cups over those we had ordered from a competitor and will be using these cups from now on for all our needs. They are also really nice and clear super super clear! Ordered these for our annual Brunswick stew, we always make about 150 gallons of stew and sell it by the quart and by the pint. The lids would not fit properly and were very flimsy. After several failures, we stopped using them all together and had to purchase some from another nearby restaurant to use. The lids just don't fit properly and are very thin. Thank you for the review, Bethany! We're sorry these have not worked well for you. A Customer Solutions Representative will contact you soon! GREAT PRODUCT! These are a super easy way to save the extra product to use the next day. Our staff loves them. It is a good buy! We love this 32 oz. container. We use them for two mayor purposes: retail packaging for our spreads or salads or like a container for ingredients when we cook in client house. For both it works great! We use these containers for bulk deli salads, they're very durable and the lids stay on tight which is important for customers on the go! These were great for soups! The only setback is that the container is a bit thin so pouring really hot soup in it makes it really soft and a bit hard to put the cap on if anyone is looking for containers to hold really hot soup to go. These are such a great value, and keep all our fillings and buttercreams neatly stored. Last for a number of washings, so you only need to invest in a couple cases a year. Awesome! We use these for Togo products at restaurant and they are very versatile. I will advise though be careful when using extremely hot soups or foods they will melt. Great microwavable container that is large enough for multiple servings. Good for lunch for a group or for tailgating. Hot items are a perfect fit for this container. We use these containers for everything. They are perfect for our soups and salads and our customers are happy to either keep them to reuse or be able to recycle them instead of just tossing them in the garbage. These are our go to containers for our clients, hot or cold they're good containers. Our clients say they hold up well to microwave re-heating and they're a good price for us - we use the 32, 16, 12, and 8 oz. sizes. We use these containers to provide bulk orders. The food in the container is sufficient for 4 servings. Good quality and easily can be use for medium heat iterms. We prefer to use these for all of our dressings etc. it makes it way easier to refill squirt bottles and store in our coolers. this was on sale when I bought it. it is a lot for me to consume, but paying for this seemed not a good wise decision, now I do not regret it because the containers are clean and some day I know I will use it up, but now they takes up a lot of space and time to take care of them. Over all I haven't regret buying this... but may not buy another 250 count again. I bought this one and used to store a semi liquid item and it is really tight and did not spill even a drop. I really would buy again and recommend for those who wish to buy something good for a nominal price. This deli container and lid combo is a great buy. They work perfectly and are good quality and price. We will definitely be purchasing more of these when we run out. Love these for packing leftovers and putting in the freezer They are very sturdy. And being able to see through them makes it so nice. Also very easy to mark on the top the date. Thanks for your review! This container and lid are designed to securely hold dry food and liquids. If you are looking for a more durable alternative, check out the 32 oz. Microwavable Plastic Deli Container with Lid, item 128HRD32 COMBO240. We bought these because the heavyweight 32 oz. containers have been unavailable since Hurricane Sandy. We use them to package and freeze soup for sale in our shop and at farmers' markets. The lids do not maintain a secure seal during freezing or transport and often break. Our customers are unhappy with this change. If there was an acceptable alternative, we'd use it, but have not been able to find one. Thank you for reviewing this product! We recommend trying out item 128HRD32 COMBO240 for a similar product with a secure, snug lid. We offer our customers the option of by a quart of our daily homemade soups. We've been very happy with the product and will continue to purchase them in the future. Fantastic containers for any kitchen! Great for storing leftovers and so much more! Excellent for fruits, pastas, sauces, stocks and even soups!! Great price and easy to store! Lids make these containers perfect for stacking and storing in the refrigerator/freezer!! !